This recipe I am sharing today is one of my all time most loved recipes. Everyone goes crazy for it! 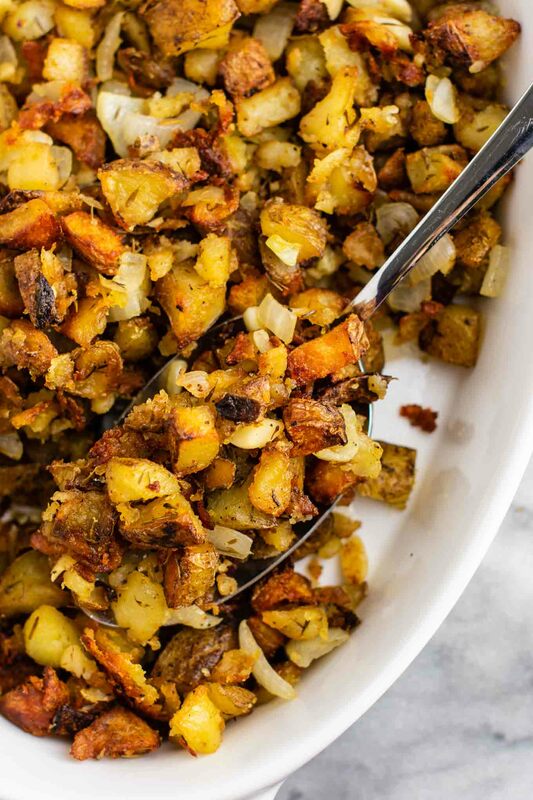 I am going to start off by saying I may be pushing those food blogger lingo rules by calling this famous crispy potato casserole a “casserole”, but stick with me here. This dish is the perfect casserole to make for any family get together (or fancy weekend breakfast/brunch). 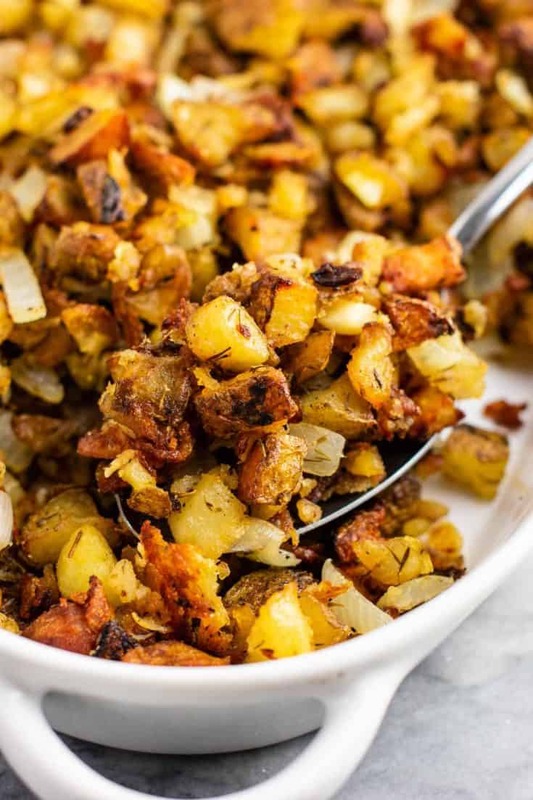 Anyone that knows me knows how much I love potatoes – they are just so versatile! Case in point? All of these are vegan potato recipes on Build Your Bite! Can you tell I love potatoes?! 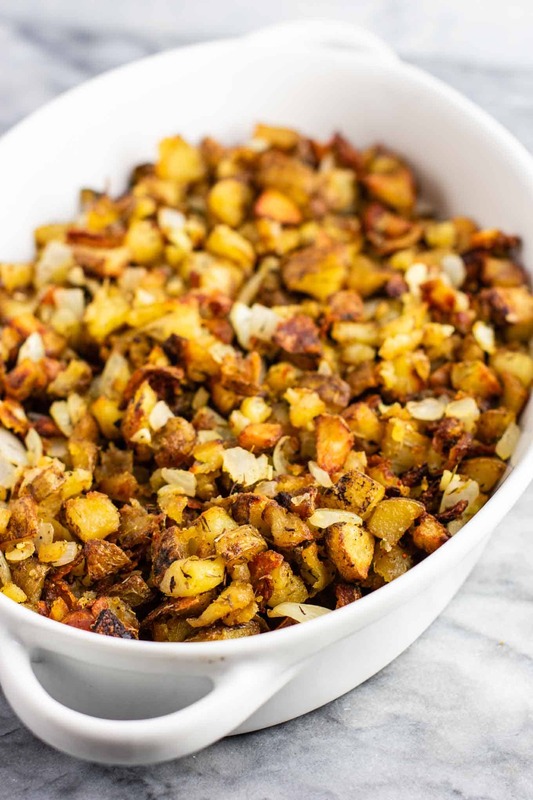 Although I love potatoes in many forms, this Famous Crispy Potato Casserole is arguably my favorite potato recipe ever. I make this recipe often for family get togethers or cookouts and it’s always a huge hit! Just today I made it for lunch with eggs and it was amazing! First, dice up your russet potatoes and place them in a glass casserole dish. Sprinkle on the thyme, salt, pepper, garlic powder, and onion powder. Drizzle the olive oil over the potatoes and use your hands to toss them until the oil coats the potatoes. Spread out the potatoes in an even layer to make sure that they cook evenly. 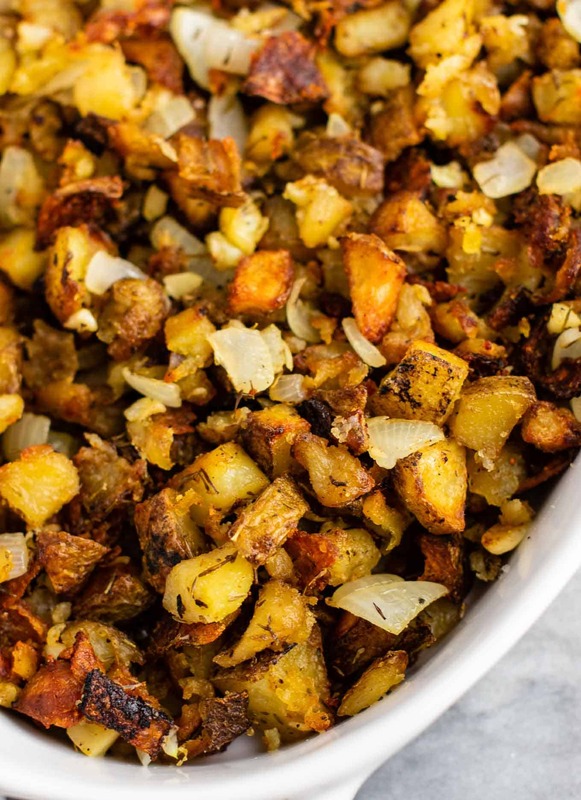 Roast at 425 degrees until potatoes are crispy on all sides, stirring and flipping every 15 – 20 minutes. Pro tip: use a spatula every time to scrape up potatoes that stick to the dish. This is where you get all those delicious crispy bits from! 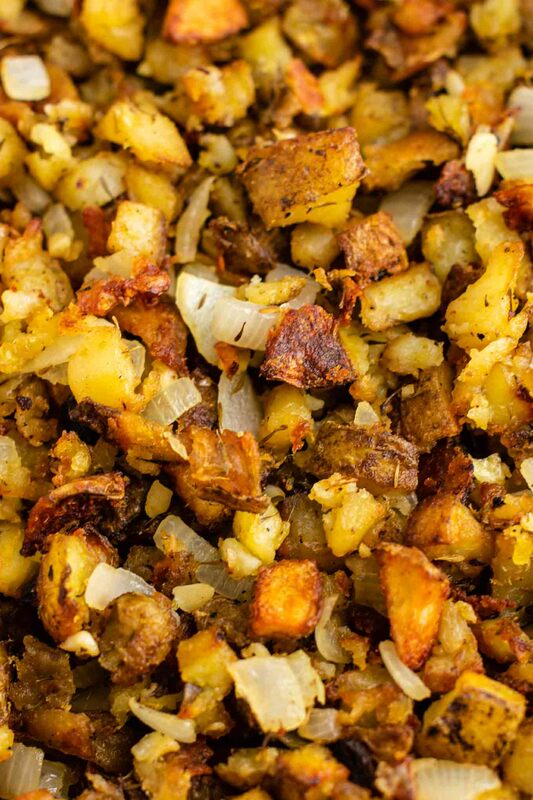 The secret is in the depth of flavor you get from roasting the potatoes for hours. The ingredients themselves are simple..but the real magic happens in the oven! Once the potatoes are almost done cooking, make your garlic and onion mixture. Dice up the fresh garlic and onion and add it to a skillet with a touch of olive oil. Cook for 10 – 15 minutes , stirring often, until onions are caramelized and soft but not burned. Once the potatoes are done, you will mix in the caramelized onion and garlic for extra flavor! The goal is to get the potatoes as crispy as possible without burning. You will take them out every 20ish minutes and scrape and stuck pieces from the bottom of the pan. The easiest way to do this is to use a spatula upside down to scrape up any stuck potato edges. 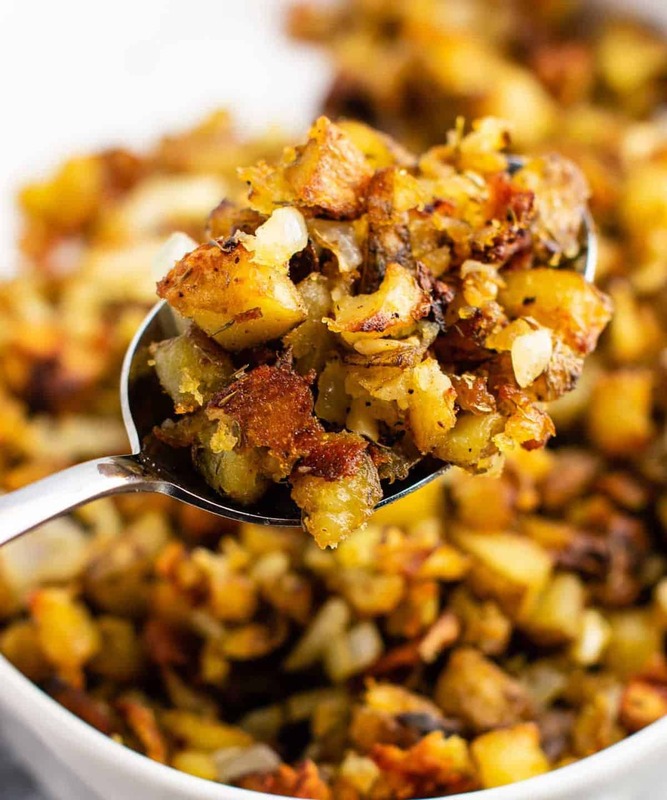 The method is the same one that I use to make my simple vegan breakfast hash and my sweet potato hash. I even use hash in my vegan breakfast burritos for crazy flavor! 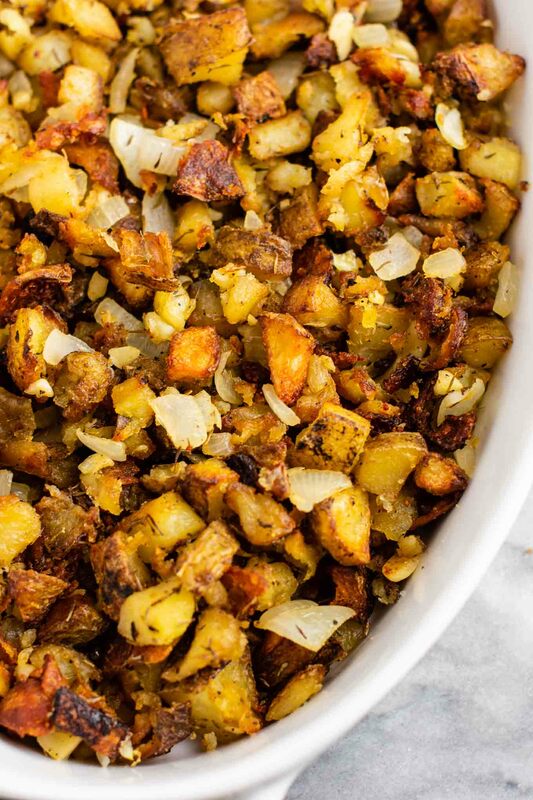 At the end, you will have tender potatoes with crispy bits that just melt in your mouth. I could literally eat this every week and never get sick of it! And trust me…the cook time is so worth it. Just wait until you see how fast it will disappear when you make it! I usually make a double batch when I take it anywhere. And there are no leftovers when I do! If you make just one new recipe this week, try this! 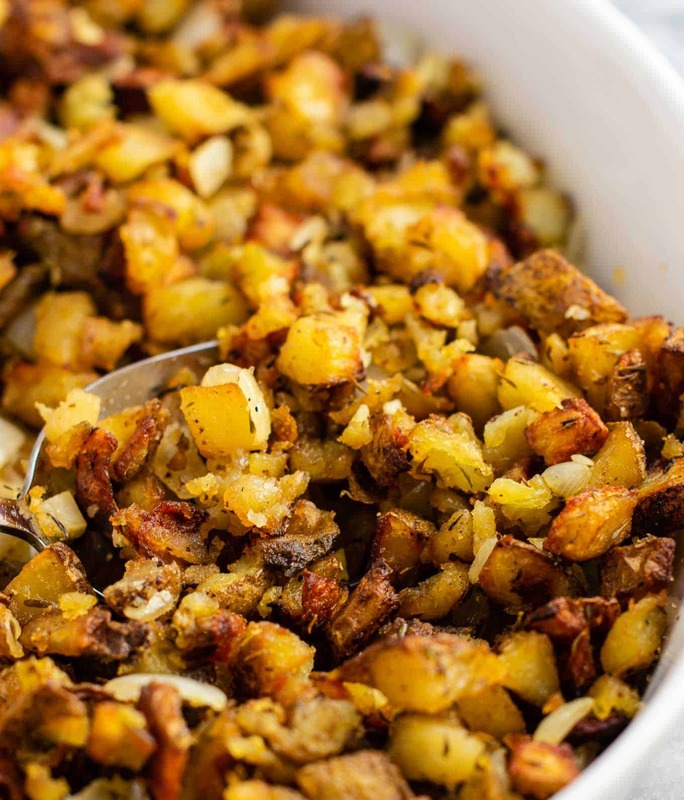 This famous crispy potato casserole is a guaranteed crowd pleaser! 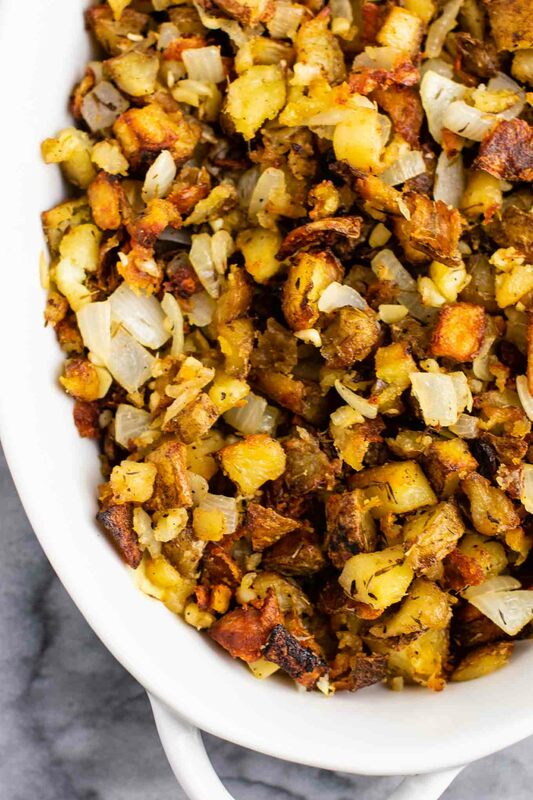 The holy grail of vegan potato recipes! Every 20 minutes, remove potatoes from oven and use a spatula to scrape any stuck pieces from the bottom of the pan and toss potatoes around. 1. It's important to check on the potatoes every 20 minutes since we are roasting at a high temperature. To avoid burning, make sure to use a spatula to scrape sticking pieces from the bottom and toss around. 2. The potatoes will soften as they are out of the oven, but the flavor is insanely good! They reheat well, just keep in mind that they will be more crispy straight out of the oven. Hi Joani! You can sign up in the side bar there is a box to subscribe! This was so good I didn’t want to share! Can this be made the night before and warmed prior to serving? You could, but it won’t be quite as crispy. If you do, I would suggest reheating it in the oven for optimal texture. Those should work too! Just may be a slightly different length of cook time, so keep an eye on them. Could I add some type of protein to it, and what do you suggest?